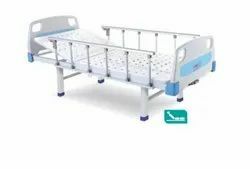 Prominent & Leading Manufacturer from Hyderabad, we offer manual backrest bed epc head & foot bows, attendant bed, hospital causality bed and semi fowler bed. 60mm x 30mm CRCA tubular frame work. 2 section perforated CRCA sheet top. Manually operated six position backrest on ratchet. Sizes available as per user needs. A pair of side railings. CR Rectangular Tubular frame work. 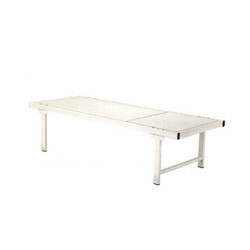 ‡Approx size: 1980mm (L) x 760mm (W) x 600mm (H)‡2 section perforated CRCA sheet top.‡Backrest, Trendelenburg & Anti Trendelenburg operated by screw and lever mechanism with 2 separate cranks.‡The Bed can be used as trouma trolley‡Mounted on 150mm dia castor wheels with two brakes‡Pre treated powder coated.‡Optional: Collapsible side rails. 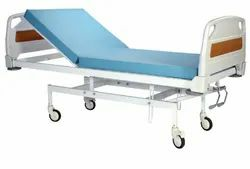 Overall size: L 2080 mm x W 980 mm x H 550 mmPerforated CR sheet top.Backrest operated by crank.Back rest lifting angel is 0-80 deg.4 locations for IV rods.Pre treated & Epoxy powder coated.Sizes available as per user needsRemovable PP moulded head & Foot ends. 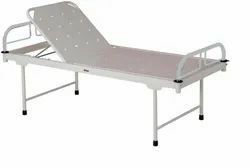 Looking for Attendant Bed ?